On October 12, the Urban Libraries Councilopens a new window (ULC) announced that we are one of the twenty most innovative librariesopens a new window in the nation. The 2017 Urban Libraries Council Innovations Initiative showcases programs that provide lifelong learning opportunities, meet the unique needs of diverse audiences, leverage technology to connect people with each other and vital resources and address community issues. Children participating in the Big Lift Inspiring Summers program. The ULC is recognizing us for our Big Lift Inspiring Summers programopens a new window, which serves low-income children and reverses summer learning loss. The Big Lift Inspiring Summers is a rich academic and experiential learning summer camp, and the kind of experience that is usually out of reach for low-income families. 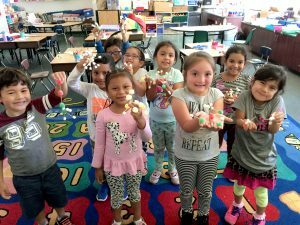 The five-week program provides Kindergartners through 2nd graders with project-based, hands-on STEM learning activities, healthy meals, exciting field trips, and books to fill home libraries. Every summer, low-income youth lose two to three months in reading while their peers from higher-income families make slight gains. As a result of participating in Inspiring Summers, children in the 2016 program gained an average of one month of reading skills; in 2017, children gained an average of one and a half months of reading skills through the program. Additionally, in 2016, the program served 753 children at six school sites in the South San Francisco Unifiedopens a new window, Jefferson Elementaryopens a new window, La Honda-Pescadero Unifiedopens a new window and Cabrillo Unified Schoolopens a new window Districts. In 2017, the program served 1,297 children at eleven school sites, by expanding to work with the Ravenswood Cityopens a new window, Redwood Cityopens a new window and San Bruno Park Schoolopens a new window Districts. - Supervisor Carole Groom, District 2, who serves on the Libraries’ Governing Board. The Big Lift Inspiring Summers program is a collaborative effort between San Mateo County Libraries, the County of San Mateoopens a new window, the San Mateo County Office of Educationopens a new window, Silicon Valley Community Foundationopens a new window, BELL (Building Educated Leaders for Life)opens a new window and the seven school districts above. The program was made possible by the San Mateo County Board of Supervisorsopens a new window who committed funding from Measure Kopens a new window, a countywide half-cent sales tax extension for local needs.